Over the last four years we have been purifying drinking water in West Africa using simple, solar power driven water purification machines. This machine, the so called UV WaterBox, inactivates the most dangerous E-coli and coliform bacteria in water effectively using UV light. 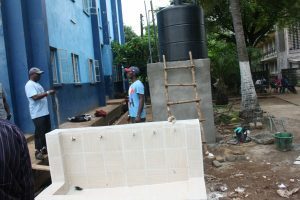 The system purifies 5.000 to 10.000 liter of water per day and is stand alone and fully independent of the public grid. Even on cloudy days, or at night, water purification can be prolonged because a battery is included in the system. The UV WaterBox is robust and needs minimal maintenance to keep the system in good condition: The UV lamp used has an expected lifetime of 10.000 hours, corresponding with a time period of 3 years, based on 10 hours of water purification per day. 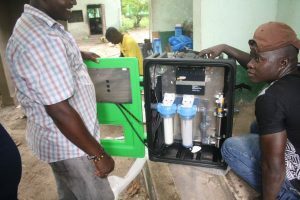 “We are very happy to distribute the UV WaterBox in Sierra Leone! I am using it myself in the water shop we are running. We simply produce the best drinking water of Freetown. 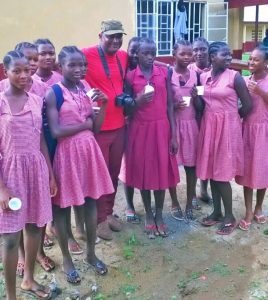 We often deliver the system to schools so that the pupils do not have to drink contaminated water any longer. The UV WaterBox also makes my installation manager happy because the system is easy and simple to install. And it runs on solar power which is quite useful in Sierra Leone with an electrical grid that is more off than on! ”. Interested to learn more about the UV WaterBox. Let us know.